Beside of Bánh Chưng, Rice Cake with Pork Belly and Mung Bean (Bánh Tét) is also a first choice of many people, especially in South Area, Vietnam. 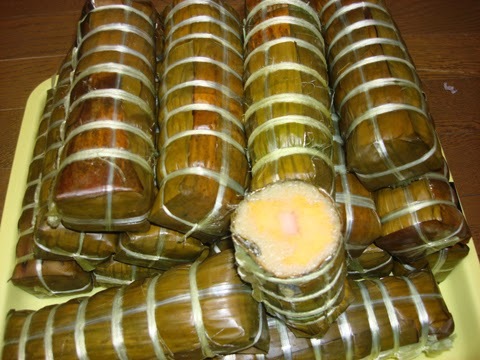 When the people in North choose Bánh Chưng in Tet Holiday, the southern people prefect Bánh Tét. Here is one of Vietnamese Food Recipes can not miss in these days. 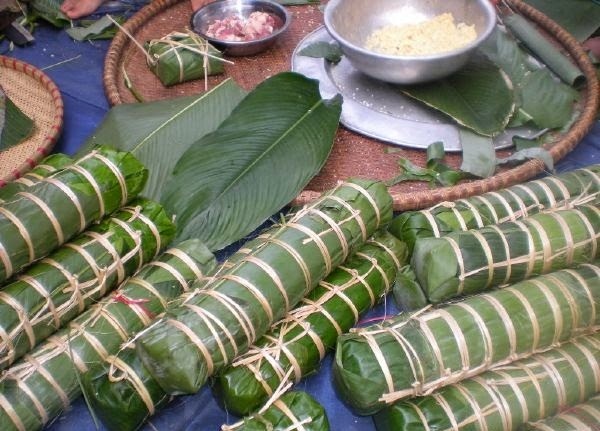 When we use phrynium leaves for covering Bánh Chưng, banana leaves is a good choice for Bánh Tét. 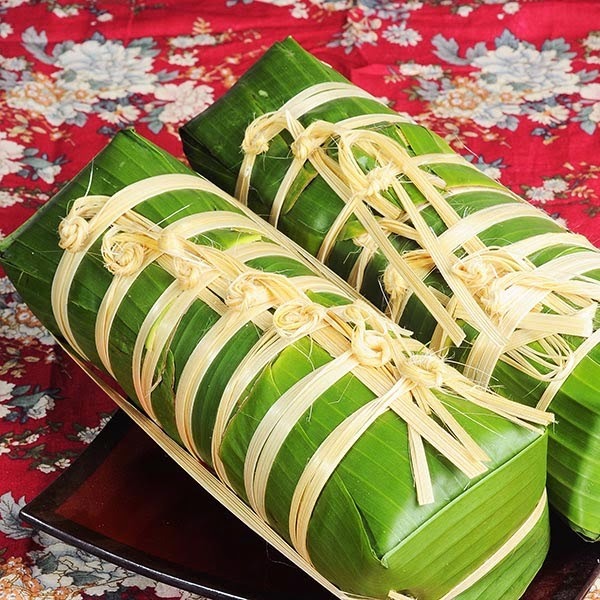 If you want to feel how amazing feeling in Tet Holiday of Vietnamese people, you should not miss one of amazing Vietnamese Food Recipes like this cakes for your family. If you do want to cook, please follow our instruction below carefully. Purple onion, pepper, salt, Maggi’s stuff. Step 1: Choose banana leave have a large width. Clean carefully, dry in the sun in 1 - 2 hours. Step 2: Clean sticky rice in water added a little salt. Soak in 1 night and then add a little salt, mix well. 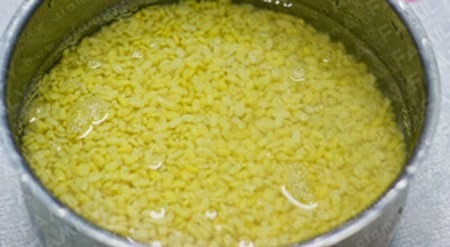 Step 3: Soak mung bean in water until they are soft. Bring to steam and then mix with fried purple onion + vegetable oil + salt + pepper and Maggi’s stuff. Step 4: Clean pork meat with water added a little salt. Slice into long pieces. Step 5: Cut banana leaves into 40*40cm shapes. Step 6: Put 2 leaves across and 2 leaves along together. Put the larger leaves in the middle. Step 7: Pour sticky rice in the middle of leaves. Spread gently along. Next, add more mung bean and pork meat on center. Step 8: Pull one leaf in along edge up, pour more sticky rice to cover the filling. Next, fold 2 edges and roll into circle shape. 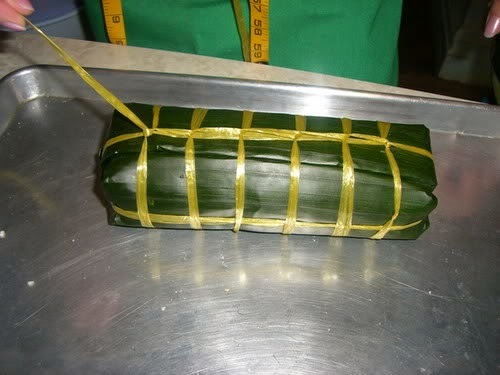 Roll firmly and use bamboo rope to tie on the middle of cake. Step 9: Continue to fold another edge of cake and put the cake stand up. Press all ingredients inside to stick together firmly. Fold the last edge and continue to tie them by bamboo rope. You can look the photo below to see its process. Step 10: Add some banana leaves in the bottom of pot, arrange Bánh Tét into pot and pour water to cover all them. Cook in 5 - 6 hours (for 7 – 10 Bánh Tét). Follow this process carefully, when water nearly run out, ad more hot water if not you can not create one of stunning Vietnamse Food Recipes for Tet Holiday. Finally, your dish is basically finished. When Bánh Tét is cooked, put them on basket and wait to dry. Store in clean and fresh air which can keep the good quality for cakes longer. Eating this cake with Dưa Món Củ Kiệu is perfect. Hope you love this dish and do not miss our other stunning Vietnamese Food Recipes next time. Happy Lunar New Year and Good Luck for your Cooking.